The South Korean KSLV-1 rocket sits on the launch pad during ground tests before its first launch in 2009. WASHINGTON? South Korea attempted its first space launch Tuesday, but its satellite payloadwas still unaccounted for hours after the domestically built rocket lifted offfrom Goheung in the southwestern part of the country, according to an officialwith the South Korean embassy here. The KoreaSpace Launch Vehicle (KSLV)-1, which features a Russian-supplied first stage, liftedoff at 5 a.m. EDT (0900 GMT), according to Jin Eyungsul, science counselorat the embassy. However, the payload - an atmospheric monitoring satellite -did not return signals sent from the ground at various scheduled intervalsfollowing the launch, he said. The KoreanAerospace Research Institute remains hopeful of receiving a signal during apass over a ground station that was slated to occur some 11-and-a-half hoursafter the launch, Jin said in a Tuesday interview. If the satellite is notlocated in the next three or four days, South Korea likely will requestassistance from the United States, Jin said. Jin said hedid not know if the problem experienced during launch is related to afirst-stage glitch that forcedthe postponement of an Aug. 19 launch attempt. South Koreaaims to be just the 10th country to launch a satellite into space. The nextlaunch of the KSLV currently is scheduled for May 2010, Jin said. Russia's Khrunichev State Research and Production Space Center, which built the KSLV-1's liquid-fueled first stage, said in a statement Aug. 25 that its hardware performed as designed during the launch. "The Russian side of the joint project should regard the launch as successful while for the Korean side it is only partially so," Khrunichev said in a statement posted on its Web site. South Korea built the rocket's second stage and payload. A glitch with the first stage of the KSLV-1 forced South Korean officials to postpone an Aug. 19 launch attempt. South Korea aims to be just the 10th country to launch a satellite into space. 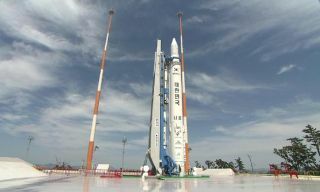 The launch of the next KSLV currently is scheduled for May 2010, Jin said. According to Khrunichev, the KSLV is 33 meters tall, 2.9 meters in diameter and weighs 140 metric tons. It is capable of placing a satellite weighing 100 kilograms into an elliptical orbit with a perigee of 300 kilometers and an apogee of 1,500 kilometers. Khrunichev signed the contract to develop the KSLV's first stage in 2004, the company said. Its subcontractors include NPO Energomash, which supplied the propulsion system, and the Transportation Machine-Building Design Bureau, which designed the launcher's ground complex, Khrunichev said.